Data from the Centre for Monitoring Indian Economy (CMIE) suggests declining capex in both the public and private sectors, raising concerns on growth prospects of both infrastructure and capital goods sectors. Indian companies announced new projects worth ₹ 1 trillion in the December quarter, 55% lower than the year-ago period, CMIE data shows. But this data typically gets revised upwards by 40% within six-eight weeks from the end of the quarter. Even so, the likely revised number will also represent a sharp 33% drop and will stand at a multi-year low. While it was known that orders from the public sector were set to decline ahead of the elections, the sharp fall in new investments in the private sector has raised alarm bells. Also, it comes on the back of green shoots of recovery seen in the first two quarters of FY19. Capital goods firms such as Siemens Ltd, ABB India Ltd and Voltas Ltd reported 30-35% rise in new orders in Q2FY19, although these were mostly short-cycle projects related to brownfield expansion, automation and improving productivity. Besides, growth came off a low base, as demonetization and the goods and services tax had impacted growth a year ago. 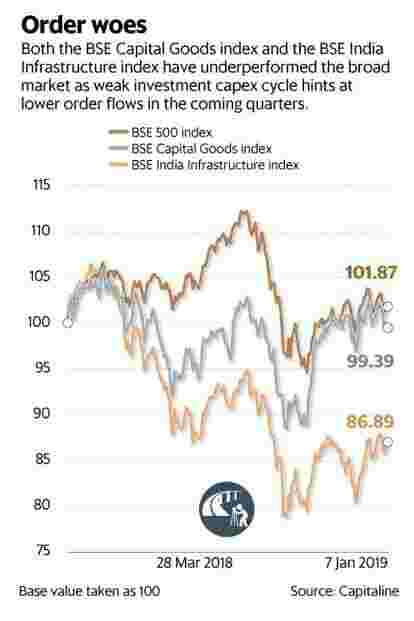 But considering the companies’ focus on short-cycle projects and execution, the BSE Capital Goods index has outperformed the BSE 500 index in recent months. Some analysts are hopeful of orders being bunched up in the next two-three months, particularly in roads, which should help some infrastructure companies. Besides, private sector industrial, short-cycle orders are likely to continue. But the slowdown in consumption and retail sales, including automobiles, since July, is a worry. If capacity utilization, which has touched 70-74% in key industries, stagnates, it may stall further expansion in the private sector. Further, stressed assets in many core sectors, along with the financial sector crisis, may delay capex cycle traction. Be that as it may, a silver lining in all this haze around the capex cycle revival is that most firms are sitting on decent order books. This would see companies focus on execution and working capital management to drive revenue and cash flows. For instance, infrastructure giant Larsen and Toubro Ltd and some road construction companies such as Sadbhav Engineering Ltd have trimmed costs and working capital to improve cash flows and earnings. Stock valuations have also corrected in the last few months. Investors will do well to turn their radars on to firms with strong order backlog and execution capabilities. This would drive revenue and earnings growth, and tide over the anticipated slowdown in capex cycle through 2019.